Students in each school are under the special care of Pastoral Guardians. The position of Pastoral Guardian is a leadership role designed to promote a sense of belonging and unity within the College. The Pastoral Guardian is the leader of a team providing inspiration, encouragement and assistance, and promoting a cooperative, consensual working relationship among the teachers involved with the student group. She/he shows leadership by supporting all staff in ensuring that each individual student is known and cared for in the school environment. This leadership position is undertaken with the expectation that the Pastoral Guardian understands the particular needs of adolescent girls and their particular stage of development. 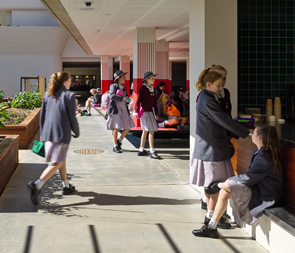 The Pastoral Guardian works with the College Leadership Team and the Home Room Teachers to show leadership in setting and maintaining high standards of behaviour and dress among students, both in and out of the classroom, and to acknowledge and encourage high levels of participation in school and community activities.